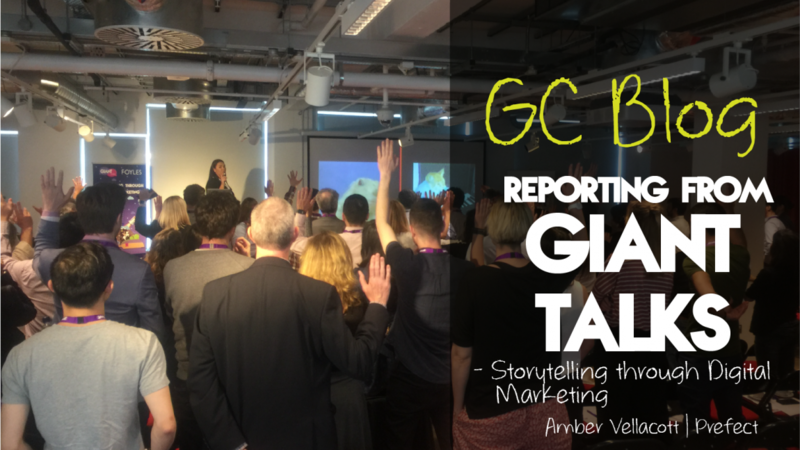 On Tuesday we travelled up to London to attend Giant Talks, an event hosted by our sister company, Sleeping Giant Media, at the amazing Foyles Bookshop in Soho. Kate Fitzgerald from Google flew over from Dublin to speak on the topic of YouTube – The World is Watching! She spoke about the use of online video content and adverts and how to really capture your audience’s attention. Her talk was really engaging with lots of weird and wonderful advert examples and audience games, competing against each other to win some YouTube goodies. We also heard from SGM’s very own Managing Director, Anthony Klokkou. He spoke about how to become a hero in digital marketing. He told us that the key is understanding what is at the heart of your customer’s needs. He included some awesome and funny visuals during his presentation, even a quiz which Prefect Amber absolutely sucked at, the shame! The talks attracted some big names to the sign-up list including the likes of Harrods, Shell, BBC and Herbalife. GC had such a good time, all the speakers were amazing and the event was really well organised and attended. We were kept constantly engaged and entertained and we learnt a lot. We hope everyone else had a great time. After the talks, we all met for a drink at the Soho Hotel. It was great to spend some time with Roff & Co, Space Between and Interactive Red. The next #GIANTtalks is on June 6th at the amazing Brands Hatch and is all about Overtaking Your Competitors. Our very own Head Boy Danny will be delivering a talk at this exciting next event, so it’s not something you can afford to miss! More information about future Giant Talks is yet to come, so keep a look out.